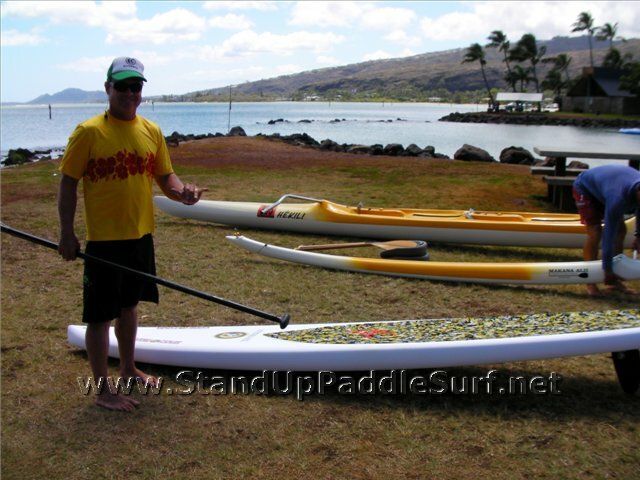 During one of our downwind runs, Todd Bradley showed me one of their new prototype stand up paddle boards, the 12′6″ “Switchblade”. Todd mentioned that the board will be in production at BoardWorks and will be out in stores soon. Lotsa’ 12-plus racing/touring stand-up paddleboards out there now, but most are either wobbly elite-only race machines?or sedate, sluggish cruisers. What if you want to do both? The new C4 Waterman ‘Switchblade’ is the answer: It’s battle-tested plan shape, the result of numerous generations of prototypes forged in the C4 Jet Propulsion Laboratory, is comfortably wide and stable enough for Ma and Pa Kettle to tour Lake Wannamuckaround, but streamlined enough to take on that summer race you’ve been trying to get bold enough to enter. 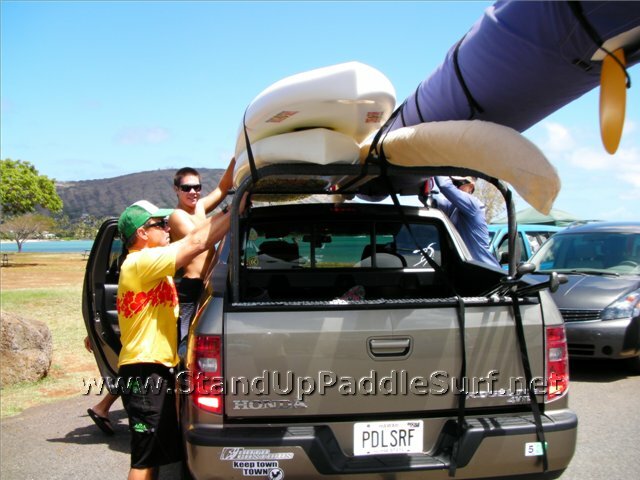 And the bottom shape is all about drag-free efficiency: The classic neutral paddleboard rocker and slippery displacement hull keeps the water flow moving along the rails and off the tail, eliminating the ’stickiness’ that arises when flat-bottom SUPs are ‘compressed’ in the water through the mechanics of vigorous paddling. Along with the recessed deck well that lowers a paddler’s center of gravity and gives him greater stability and increases the mechanical advantage of being able to use a shorter paddle, the C4 Waterman ‘Switchblade’ possesses all the same design features as it’s bigger brother, the C4 14′ V1——so you’ll always have the slick glide of a thoroughbred whether you want to win a race or lose the crowd. Travis Grant is FAST. Travis Grant is FIRST!